It looks like Windjammer is in trouble. As reported on CruiseCritic.com, the family-owned cruise line has been having financial troubles, resulting in poor ship maintenance, canceled cruises, and disgruntled guests and employees. But now, the sad end may be in sight. 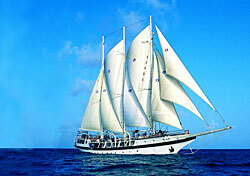 Windjammer’s four ships are all stranded in port in Trinidad, Panama, Aruba, and Costa Rica. Booked guests report that this week’s cruises are canceled, and the company’s website is currently unavailable. Windjammer representatives have been close-mouthed about the situation, so rumors are flying about whether the cruise line or its ships have been bought or whether Windjammer has permanently closed its doors. If you are booked on an upcoming Windjammer cruise, it seems unlikely that your ship will sail, so you may want to hedge your bets and make alternate plans. Members of CruiseCritic’s forums are reporting difficulties in obtaining refunds for canceled cruises. If you’re in a similar situation, you may want to initiate a conversation with your credit card company to cancel the charges. If you’re a longtime fan of Windjammer, you can keep your fingers crossed that the company will make a miraculous recovery; however, the current situation suggests the line will soon be nothing but a fond memory. Update: Windjammer has released a vague statement, announcing the cancellation of several October sailings, but promising the line is doing everything in its power to remain in business. For the complete details, you can read the announcement online.